Belkin, purveyors of cases, docks and connectors, is out with a new addition to its Mixit DuraTek cable line that's made for some of the newest gadgets on the market. Plus, it's built to last. 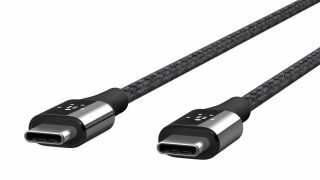 The new cable is of the USB-C variety, meaning it will work with some of the latest accessories, tablets and phones, like the Samsung Galaxy S8 and LG G6, to connect to a PC, a growing number of which come with a USB-C port. Though the total amount of devices with USB-C is still relatively small, it's a standard that's only growing in popularity. "We have always been in the business of connecting people to their technology and guiding consumers in times of transition," said Belkin CEO and Founder Chet Pipkin in a statement. "USB-C is the latest transition." "A recent report from IHS estimates an increase in USB-C device shipments between 2015-2019, increasing from under 500K to 2M," he continued. "We have always and will always create people inspired products and intend to give people the best when it comes to USB-C."
Future-proofing is all well and good, but what else is there to the new cables? For starters, Belkin's USB-C cables house conductors reinforced with DuPont Kevlar fiber, making them extra durable and helping to protect against fraying and other damage. Plus, the 4-foot long cables feature double-braided nylon for extra protection. Have a look at our Cabstone USB-C sync and charge cable. You're getting a solid cable backed by the Cabstone name on sale today on our website here.